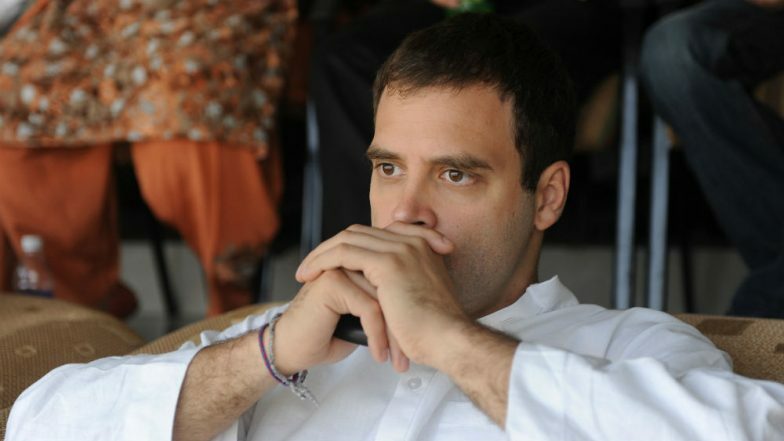 Lal Dungri, February 14: It was a Valentine's Day of sorts for a 68-year-old Parsi woman, a Congress activist, who was part of a group of enthusiastic women party workers and who went to garland Congress president Rahul Gandhi on stage ahead of a public meeting. This chubby woman, very short in height, out of the blue pulled down Rahul Gandhi, held his face with both hands and gave me a peck on his left cheek. The woman, Kashmira Munshi, also firmly held his chin and patted him on the cheek after the other women put a huge garland over Gandhi's neck. On Valentine’s Day, Rahul Gandhi Gets Kiss From Woman on Stage During Rally in Valsad, Watch Video. This incident took place in Lal Dungri village in South Gujarat's Valsad district dominated by Adivasi population from where Rahul Gandhi launched his party's 2019 Lok Sabha election campaign amid a massive cheering crowd. Lal Dungri is where Indira Gandhi in 1980, Rajiv Gandhi in 1984 and Sonia Gandhi in 2004 had launched their campaigns for the Lok Sabha polls and romped home to power. The Congress believes Lal Dungri is a harbinger of good luck that brings the party to power at the Centre.